The top diplomats of South Korea and the United States agreed Friday to maintain close coordination as both nations prepare for summit talks with North Korean leader Kim Jong-un. 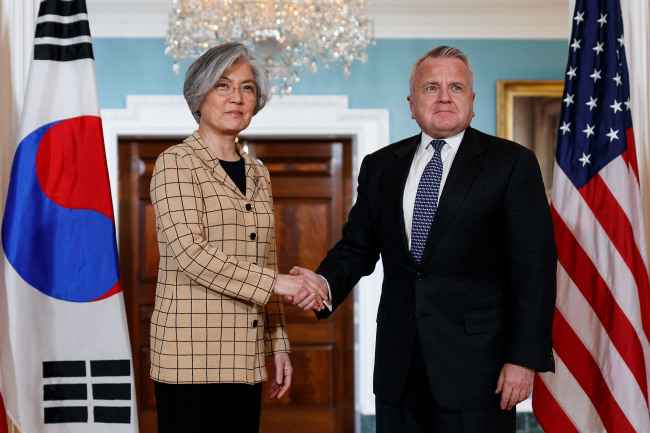 South Korean Foreign Minister Kang Kyung-wha met with Deputy Secretary of State John Sullivan at the State Department to discuss recent developments between South and North Korea, and between the US and the North. "We agreed that the inter-Korean summit in April and the US-North Korea summit to be held by May will be an important turning point," Kang told reporters after the meeting. "We agreed to work together to ensure they become a historic milestone for denuclearization and lasting peace on the Korean Peninsula." Kang said she briefly met with outgoing Secretary of State Rex Tillerson to thank him for his efforts on Korean Peninsula issues. Friday's meeting was meant to be between the two, but Tillerson was fired earlier this week. The minister said the two sides agreed to arrange talks between her and Mike Pompeo, the Central Intelligence Agency director who was tapped to replace Tillerson, at the earliest possible date following his confirmation. In a statement, State Department spokeswoman Heather Nauert said Kang and Sullivan reaffirmed that the two countries' alliance is "the lynchpin of stability and security in the region,"
particularly in light of North Korea's nuclear and ballistic missile programs. "Both sides agreed that the announcement of a meeting between President Trump and North Korean leader Kim Jong-un is a historic opportunity and evidence that the global maximum pressure campaign is working and must remain in effect," she said, referring to economic and diplomatic sanctions on the North. Kang and Sullivan "agreed that international pressure on North Korea must be maintained until the regime takes credible, verifiable and concrete steps toward denuclearization," Nauert added. Meanwhile, the South Korean minister also spoke by phone with US Commerce Secretary Wilbur Ross to "actively seek" an exemption from new US tariffs on steel imports. So far, Mexico and Canada are the only countries to have been granted a temporary exemption from the 25 percent tariff.